Shearer’s Foods, Inc. is a leading manufacturer and distributor of a broad line of salted snack foods and related products. The Company’s products are sold through wholesalers, distributors, and retail customers located throughout the United States. 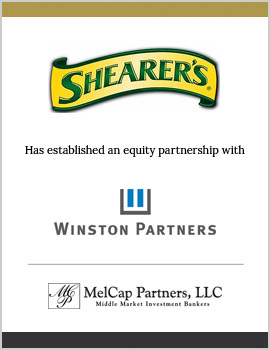 MelCap Partners acted as the sell side advisor to Shearer’s Foods. Shearer’s Foods was successfully sold to Winston Partners, a private equity group with over $1.6 billion under management.